I have moved the lock arm to the other side of the top lock as I visited it a few days ago and it is the wrong position. Original position was shown as being above the top lock. Pulteney Lock Arm is a minor waterways place minor waterways place place on the waterways major waterways place village town city on the Kennet and Avon Canal (Main Line) between Claverton Pumping Station (3 miles and 6 furlongs and 1 lock to the east) and River Avon Junction (Junction of the River Avon and the Kennet & Avon Canal) (3¼ furlongs and 5 locks to the southwest). 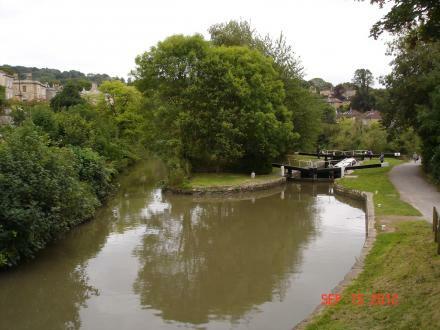 The nearest place in the direction of Claverton Pumping Station is Bath Top Lock No 13 (Flight of 6 locks Nos 7 to 13. Locks 8 and 9 have been combined into a single deep lock); ¼ furlongs away. The nearest place in the direction of River Avon Junction is Pulteney Lock No 12; ¼ furlongs away. Queen Sq, Bath, BA1 2 — 1172 yards to the west. Sally Lunn's House, 4 North Parade Passage, Bath, BA1 1NX — 717 yards to the west. Hetling Pump Room, Hot Bath Street, Bath, BA1 1SJ — 939 yards to the west. Alexandra Park, Bath, BA2 4 — 996 yards to the southwest. Bath — 27 yards to the northeast. James Street West, Bath — 1248 yards to the west. Abbey Churchyard, Bath, BA1 1LZ — 846 yards to the west. Bath Spa Railway Station (BTH), Bath, BA1 1SU — 664 yards to the southwest. Southgate Place, Bath, BA1 1AP — 875 yards to the west. Abbey Churchyard, Bath, BA1 1LT — 780 yards to the west. The Recreation Ground, Bath, BA2 4 — 561 yards to the northwest. N Parade Rd, Bath, BA2 4 — 351 yards to the west. Spring Gardens, Bath, BA2 4DS — 565 yards to the northwest. Retail 3, 8 Sawclose, Bath — 1035 yards to the west. Bath, BA1 1 — 838 yards to the west. Bath — 1115 yards to the northwest. 25 Gay Street, Bath, BA1 2 — 1238 yards to the northwest. Bridgwater House, 2 Terrace Walk, Bath, BA1 1LN — 674 yards to the west. Bath, BA2 4 — 545 yards to the southwest. Bath — 1311 yards to the north. Abbey Church Yard, Bath, BA1 1LZ — 815 yards to the west. High St, Bath — 786 yards to the west. Bath — 772 yards to the west. The Empire, Orange Grove, Bath, BA1 1LP — 710 yards to the west. 7-8 Cheap Street, Bath, BA1 1NE — 830 yards to the west. 1a Forum Buildings, St James's Parade, Bath, BA1 1UG — 892 yards to the west. 22-23 Westgate Street, Bath, BA1 1EP — 1018 yards to the west. Bath, BA1 1SU — 676 yards to the southwest. Bath — 923 yards to the northwest. Bath — 522 yards to the west. 5-10 James Street West, Bath, BA1 2BX — 1182 yards to the west. The King's Circus,, Bath, BA1 2EW — 1347 yards to the northwest. 11-12 Abbey Churchyard, Bath, BA1 1LY — 838 yards to the west. Great Pulteney Street, Bath, BA2 4BY — 659 yards to the northwest. Royal Crescent, Bath, BA1 2 — 1591 yards to the west. Upper Borough Walls, Bath — 970 yards to the west. North Parade Road, Bath, BA2 4EU — 390 yards to the west. Bath — 1237 yards to the west. Bath — 476 yards to the east. 5-6 Edgar Buildings, George Street, Bath, BA1 2EE — 1164 yards to the northwest. Walcot Street, Bath, BA1 5BJ — 925 yards to the northwest. Sydney Rd, Bath, BA2 6NS — 778 yards to the northeast. Kingsmead Leisure Complex, James Street West, Bath, BA1 2BX — 1211 yards to the west. Bath — 760 yards to the west. 11 Union Passage, Bath, BA11 — 934 yards to the west. Bennett St, Bath, BA12 — 1285 yards to the northwest. The Assembly Rooms, Bennett Street, Bath, BA1 2QH — 1275 yards to the northwest. 12 Southgate St, Bath, BA1 1AQ — 766 yards to the west.